Director/producer Martin Shore envisioned the film Take Me To The River as being part of an educational mission. 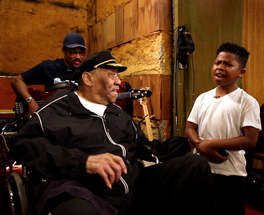 The award-winning documentary that presents footage of sessions featuring Grammy-winning legends and musical innovators such as Mavis Staples and Bobby “Blue” Bland and current artists like Snoop Dogg and Frayser Boy has forged a historic partnership with Berklee City Music, the educational outreach program of Berklee College of Music. There are educational pages and resources available through a special section of the film’s web site. “It was always part of my overall mission and vision for the project for there to be a component which lived on as a way to educate people in this country and around the world—younger people especially—about where … popular music got its inspiration and influence,” says Shore. The film took over three years to make, and Shore shot more than 3,000 hours of footage. The story centers on the musical scene in Memphis in the 1960s, where Black and White musicians worked side-by-side at a time when the South was still largely segregated. Through current-day interviews and historical footage that chronicle music history and the Civil Rights Movement, Shore depicts that sense of musical community and intergenerational connections, which he thinks has a larger message given recent racially charged events in the news. “The idea is that we have to get back to communicating and cooperating,” Shore says. “That’s the way it was in the 60s when this foundation for popular music was being built. In recognition of Black History Month, Berklee City Music will enable schools to produce their own renditions of the song. Two Berklee faculty members, George Russell Jr. and Renese King, have created vocal choral arrangements for the song that are available for anyone to download and perform at schools and in their communities. There is also an education initiative currently available as a pilot program in New York City public schools. Berklee’s Pre-University Learning System Experience (PULSE) provides a range of resources. Shore has provided curriculum developers for PULSE with access to the original masters for the soundtrack, so Mavis Staples’ lead vocals and all instrumental parts can be separated. The curriculum was designed by Dr. Dru Davison, fine arts adviser for the Shelby County Schools, which includes Memphis. “Students can go in, use the curriculum resources, the lesson activities created by Dr. Davison and take music and scenes from the film and have this immersive multi-media learning experience,” says Dr. Lee Whitmore, vice president for education outreach and social entrepreneurship at Berklee College of Music. “They can see clips from the film. They can experience the music from the soundtrack in PULSE. Then they can manipulate it. They can hear particular parts. They can remix the tunes if they want. “For the teachers, we transcribe all those parts,” he adds. “We make them available in arrangements that kids can play in ensemble if they want. An important message the film brings about is the connection between young and old, such as scenes featuring Bland, who died in 2013, and young rapper Lil’ P-Nut, now 12. Through the educational initiatives, the objective is to engage people in inquiry-based and experiential learning and open people to creativity and communication. “We cut across the social sciences and music in the work that’s been developed here and the curricular resources,” says Whitmore. “It’s living history right in the hands and in the ears of our students and teachers.